Travel far, and keep your job. This story starts like most stories in Cuba: we asked a super-friendly local (the owner of our favorite breakfast restaurant in Viñales) if he knew of anyone who could show us around some tobacco farms. 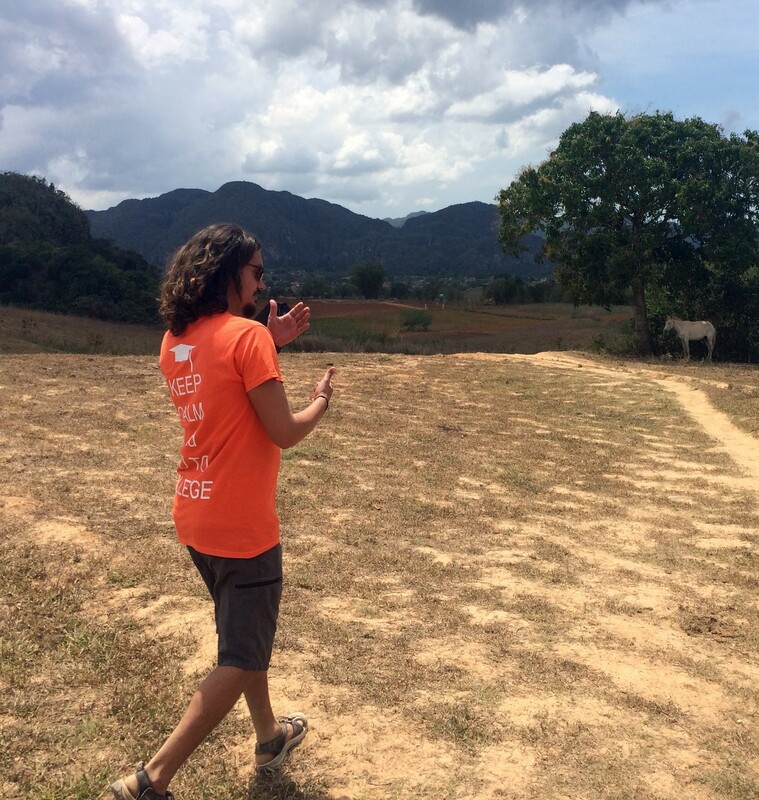 He made a few calls, and about an hour later we met up with Edrey. 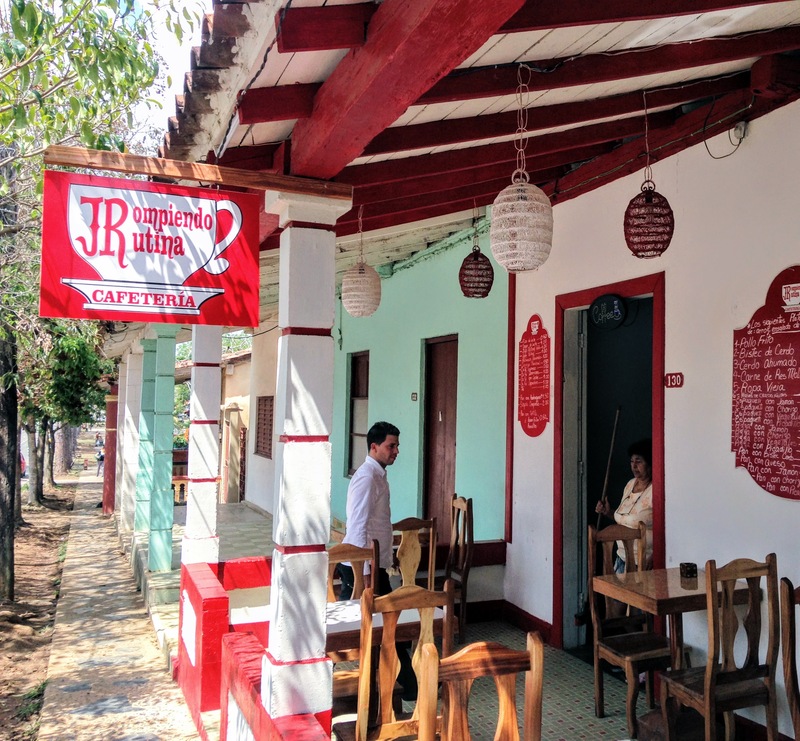 Rompiendo Rutina (Breaking Routine) was ironically our go-to for breakfast nearly every morning. They had excellent cheese, ham, and sausage pressed sandwiches and fresh juices for around 25 cents USD. We would order an extra sandwich or two to go and stuff it in our packs for a picnic lunch later in the day. The owner even wrapped it in cellophane with a napkin for us and went out of his way to connect us with other local businesses. That’s quality service! Edrey was a fascinating guy. He explained to us the system of casa ownership fees, (owners pay a fixed amount per month), the difficulty of obtaining a Cuban passport (it’s nearly impossible and he has tried twice and been denied), and that most people are very over-educated for their current roles, (the tobacco farmer we were about to meet used to be a university professor). He also has a girlfriend in Long Beach, about 20 minutes from our place, which was a pretty funny coincidence! When asked what his favorite food is, he said chicken. Any particular type of chicken? “No. Just chicken.” He had friends in all of the locations we visited, so he mostly walked us to the sites, made his introductions, and then let us explore. First, we visited a tobacco drying house. The owner of this house was an English professor in a past life who quit his job to be a farmer. 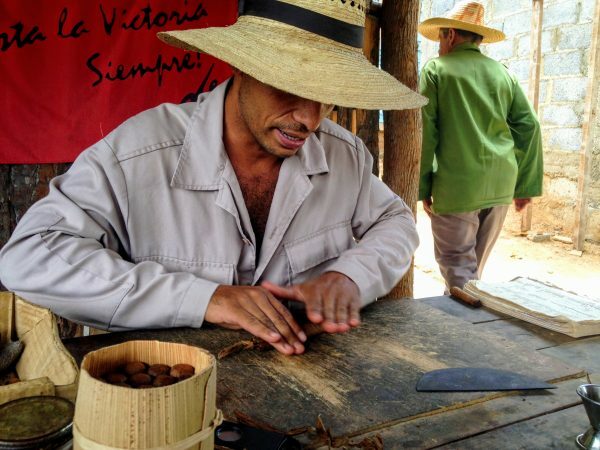 He makes far more money selling tobacco to tourists than he ever did teaching. 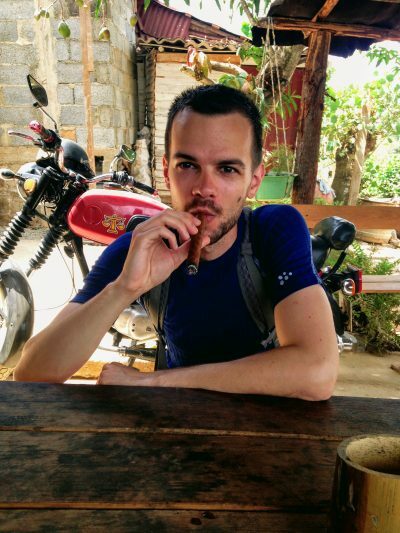 He’s concerned about the future of education in Cuba because many people like him are abandoning their posts. Consider that he sells hand-rolled cigars for $40 for a pack of 10. He may make $120 in a single afternoon, while a university professor salary would be closer to $40/month! 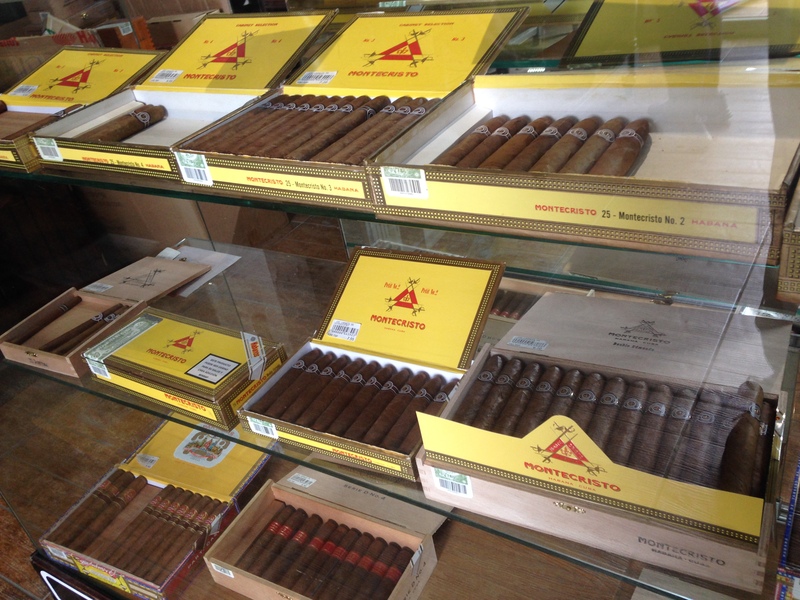 These are “puros”: are unregulated, unlabeled, traditional-style cigars. They are home-cured with a family recipe including honey and other secret ingredients the farmer couldn’t tell us. The farmer wraps them in banana leaves for storage. Farmers are only allowed to keep, sell, and profit from 10% of their tobacco crop. The other 90% is tithed to the Cuban Government, to be processed in factories, labeled, and sold in government-owned shops. 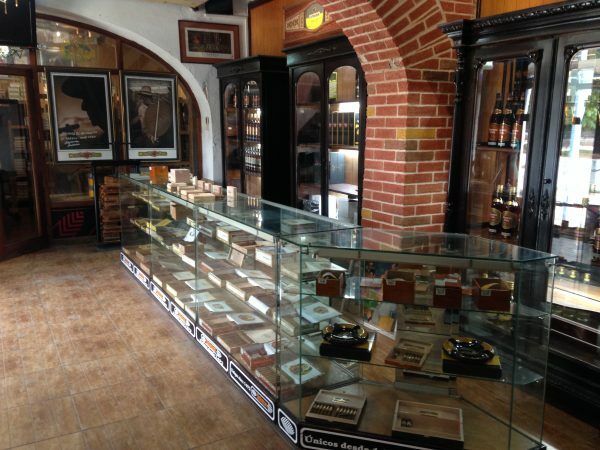 This is what a fancy schmancy cigar shop looks like in the Artesan district, near old Havana. 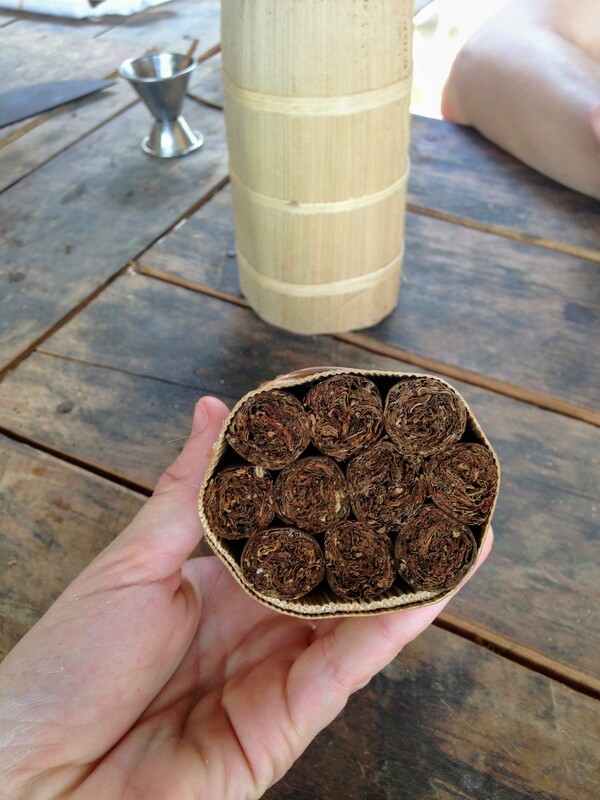 These Montecristos likely originated in Viñales Valley and are made from tobacco that was tithed to the government by a local farmer, like the one we met. After a successful, educational day in the Valley, it was time to mosey on home.